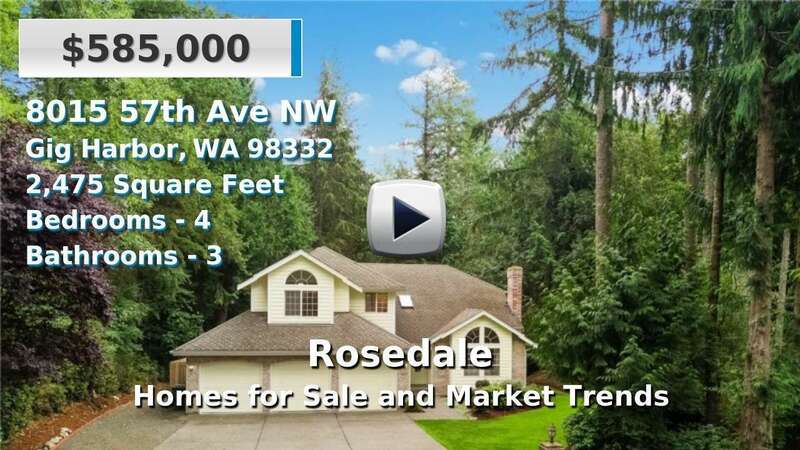 Rosedale is a suburban residential area 3 miles west of Gig Harbor near Raft Island and Kopachuck. Rosedale features single family homes for sale established in the 1970-90's and brand new subdivisions like Rosedale Heights and The Estates at Trinity Ridge, an upscale gated community. The neighborhood is close to Discovery Elementary, Kopachuck Middle, and Gig Harbor High in the Peninsula School District. Nearby Hwy 16 makes for an easy commute north to Port Orchard and Bremerton or south to Tacoma. 3 Beds | 3 Baths | 3424 sq. Ft.
3 Beds | 2.5 Baths | 2032 sq. Ft.
4 Beds | 2.5 Baths | 2346 sq. Ft.
4 Beds | 2.75 Baths | 3206 sq. Ft.
3 Beds | 2.5 Baths | 2684 sq. Ft.
4 Beds | 2 Baths | 1876 sq. Ft.
4 Beds | 2.5 Baths | 3298 sq. Ft.
3 Beds | 1.75 Baths | 1160 sq. Ft.
4 Beds | 3.5 Baths | 3686 sq. Ft.
4 Beds | 3.25 Baths | 3797 sq. Ft.
4 Beds | 2.5 Baths | 2475 sq. Ft.
Blue Summit Realty has the most accurate and up to date Rosedale real estate listings on the web. Currently there are 13 homes for sale, 1 condos for sale, and 5 vacant land properties in Rosedale. Of the 19 total Rosedale residential listings for sale 0 are bank owned, 0 are short sales, 0 are new construction, and 0 are townhomes. The price ranges from $300,000 to $0 with a median list price of $696,100 and median sold price of $617,993. Make sure to refine your Rosedale real estate search by property type, price, square footage, bedrooms, bathrooms and more with the search tool above or view the Rosedale listings on our interactive map. Our Rosedale real estate listings were updated 22 minutes ago.